The farmers market trend is on the rise in Alaska and from the Interior to Southeast regions, local vendors are answering the call to sell their produce, wares and quirky treats. Food is best when shared so we’re sharing with you a few of our favorites to keep an eye out for this summer. 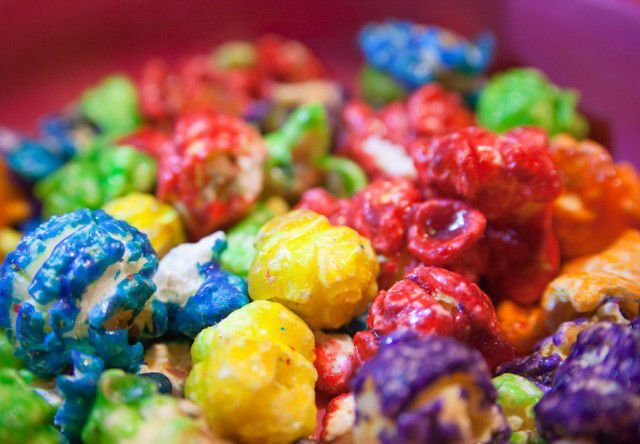 Jazzy Gourmet Popcorn takes a classic movie-night treat to the next level. The popcorn orders here come in all sizes, from mini to extra large, but the real clincher for us is the incredible variety of flavors. They’ve concocted an impressive number of options including mac and cheese, dill pickle, bacon cheddar, white cheddar and caramel, vanilla and even birthday cake. Like sticking with the traditional? The good ol’ original salty popcorn flavor is just as superb. Find Jazzy’s storefront in Eagle River, just outside of Anchorage. Take a trip back in time (to the 1950s, specifically) with Alaskan Soda Jerk and sip on fizzy creations like the Seward Shirley and the Polar Breezer. This isn’t your run-of-the-mill soda dispenser. When you buy a drink from the Alaskan Soda Jerk you’re buying an experience. With rock ‘n’ roll tunes from Elvis to Chuck Berry, period costumes and sometimes even a little dancing, you’ll be searching the crowds for Marty McFly. You can find the Jerk at fairs across the state as well as numerous public and private events. PopCycle is an Anchorage-based mobile popsicle stand operating out of an adult tricycle. A huge hit at local farmers markets, the tricycle wheels around a built-on freezer selling homemade popsicle flavors like rhubarb, blueberry lemon, pumpkin pie and carrot cake. At $3 a pop, these treats are just as affordable as they are yummy. Look out for new flavors this summer including Ruby-red grapefruit and Arctic kiwi. Fairly new to the Anchorage food scene is a food truck called KJ’s Korean Tacos. Inspired by Korean street food, some of the menu options here include traditional pork tacos and Sriracha-marinated, bacon-wrapped grilled pineapple skewers. If you’re feeling extra adventurous, try their newest invention, the KTWQ, code for the Korean Taco Waffle Quesadilla. If it sounds like a mouthful, that’s because it is! You’ll find KJ’s at weekend farmers markets all summer long and in various locations around town throughout the week. Spinnin’ Pig BBQ might be an unexpected find in Juneau, Alaska. Serving up Memphis-style meats in Alaska’s capital city, this tiny, mobile barbeque hut is not messing around. You can find everything from its staple pulled pork sandwich to the much less ubiquitous barbeque nachos where you’re challenged to uncover the chips from under a load of barbeque meat. Despite the small building, the folks at Spinnin’ Pig haul around a grill with six, 6-foot rotating racks – plenty of pork to go around! From Ocean to Table: The Season’s First Copper River Salmon has been Served!